When renting a car in Malta for your holiday, you have two options. Go with a company that will give you a traditional car hire by the daily rate or use GoTo car sharing cars and pay per minute. The main difference between the two services is the amount of paperwork involved and pricing model. Different models suit different people, so read on to see which one suits you best. You need to look into both services before you arrive; however, when comparing the two, GoTo will take less paperwork and get you accepted as a driver within 24 hours through an online application. You will also be able to contact our customer service agents and get your queries answered before you arrive. Regular car rental can mean a lot of time spent presenting your licence and verification documents and the filling in of forms, which can also take a bite out of your holiday. If you crash, you can kiss your day goodbye with a regular car rental, because the waiting time and bureaucracy in Malta are just over the top. Whereas GoTo will provide you with another car as fast as possible. Car damage pictures are uploaded to the app to file a report and you’re let off the hook for the day. GoTo cars will also save you time and money. You can simply pick up one of these electric vehicles (with designated parking spaces) off the street. You only need to book fifteen minutes earlier and can drop off the car at your destination by parking it in the designated parking spots. With GoTo, your trip from the airport is likely to cost you less than €15. With traditional rent a car services, you can also opt to have the car waiting for you at the airport; however, this usually carries an extra charge ranging between €12 and €15. If you have a mishap such as a lost suitcase or breakage and delay picking up the car by up to 1 hour after landing, you could lose your rental booking as well as your deposit. GoTo cars are available to all registered users all of the time, so you just need to book 15 minutes before driving and you’re good to go. No extra charges, just the per-minute charge of €0.28. GoTo requires that you buy a Pre-Paid Tourist Plan - 150 driving minutes batch at €42. If you need more minutes, you will pay a standard rate of €0.28 per minute. All GoTo cars are electric and automatic; this saves you time and money that could otherwise be spent on finding and buying fuel. In Malta, cars drive on the right-hand side (like the UK), so if this is your first time driving on this side of the road, we recommend GoTo because an automatic car has less distractions and is easier to use. It is advisable to use an automatic car if you’re used to driving on the other side of the road. Our cars also come with easy navigation services within the GoTo app and a customer care button inside the car where you can speak to a real person from our customer service department by simply pressing a button. When deciding which service to use, your destination matters too. 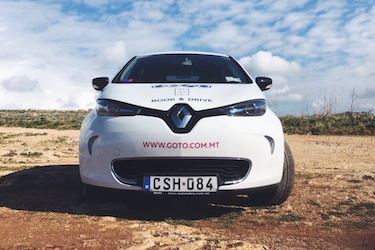 If you’re staying in a congested area such as St.Julians, Sliema, Paceville, Valletta, Bugibba or Qawra, it is advisable to use GoTo cars because with the car sharing service, you also get reserved parking. These areas are notorious for very long parking search-time and this will add frustration (and occasional desperation) to every trip. Not to mention a much higher fuel cost than your car hire estimates would have anticipated. Are you undecided on which option might be the best for you? Speak to one of our agents or check out the FAQ section.